The Stourbridge Canal looking towards lock 13 on the “Stourbridge 16” flight. The canal, opened throughout in 1779, ran from Stourton Junction on the Staffordshire & Worcestershire Canal through to Black Delph, the start of the Dudley Canal. The building to the left of the image is what remains of Stuart Crystal’s White House glassworks, this building once continued beyond the lock. 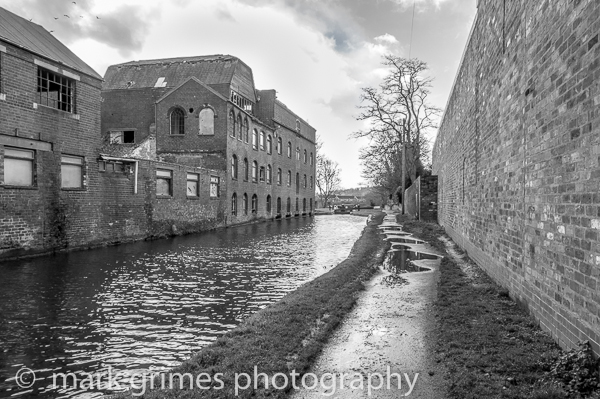 Opposite the White House on the towpath side, the brick wall was once the boundary of Richardson’s Wordsley Flint Glassworks which has since gone to be replaced with light industrial works, at least still providing some employment for the area. A reight Bobby Dazzler this, and no mistake! The twannocks have taken a sledgehammer to this country, what with the loss of all our industry and its history. Thank heavens you’re out pounding the path and snapping what’s left of it, along with all those belting canal scenes. Far superior to a lot of the Barry White stuff i’ve seen on the net. You’re a bostin photographer Mr Grimes, and thou’s made a right slart in the world of heritage. If this photo were a child’s sweet, then I think it would most certainly be a gobstopper. Only in this case: a breath-stopper. Indeed, I would like nothing more than to add my own personal praise to the chorus of adulation that has risen up for this piece of fine art. I am, unsurprisingly, in full accord with the reviews of the contributors who have gone before me, but I feel I may be able to add just a little in the way of justifiable laudation. One thing that has escaped the attention of previous contributors, with the greatest of respect to them, is the undeniable outline of a figure in the puddle nearest to the viewer. I don’t know whether any other viewers have been able to discern the watery outline of a man with an outstretched arm reaching out longingly toward the brickwork of the wall. It’s very subtle, a hallmark across the range of photos that constitutes this online gallery, and so may go unnoticed by the casual observer. But it is there nonetheless, and I would wager that this was most certainly a deliberate act. I was discussing this very matter with a friend of mine while sitting beside the fireside at the Stag at Redhill. The peaceful ambience was rudely punctuated, though, when he had the effrontery to insist this artistic feature was a mere fluke. The photographer will be pleased to know that my fireside drinking companion received a stern rebuke, made all the more dramatic by my rising from my chair causing it to scrape loudly across the flagstones which preceded my administering my chastisement in a most audible manner. ‘You really think that a feature such as this can arise unbidden in the mind of the photographer?’ I demanded at the top of my voice. ‘Maybe not unbidden, but just unconsciously,’ he said, reddening a little in a cowardly and sheepish manner. By now quite a few of the inn’s patrons had come over to see what was occurring near the fireplace. ‘Forgive me, but outrageous lack of appreciation for a fine work of art is one thing that makes my blood boil over,’ I said before leaving the company. I am, therefore, delighted to read the comments of other appreciative aficionados, who have an eye for creativity and are not afraid to express it. Bravo to the photographer – rendering a service to us all, no matter who we are. I would thoroughly endorse the comments of the previous poster, especially the point about Britain’s decline and its once great industrial past. It breaks my heart when i think about the mass closures of these symbols of productivity and useful labour, whether it be the refineries, chemical works, steel works, collieries, shipyards-all served a grand purpose in providing substantial employment, a glorious work ethic, and a proud contribution to the country’s national wealth. Looking at buildings such as the White House-which you have captured so magnificently-I am filled with a certain nostalgia for the Victorian era, and wonder if life was really so bad for the majority. How wonderful it must have been to have had one’s life determined by the environment, so that there wasn’t the agonising confusion of trivial choice that has so ruined our modern world; and how invigorating to have been alive at a time of such inventiveness and architectural splendour; i’m thinking of the development of transport links, especially the canals and railways, the burgeoning technologies such as the sewage system and gas lighting, and marvels such as the Clifton Suspension Bridge. I am filled with pride when I think of all the magnicent additions to the British landscape that emerged from the spirit of enterprise in the Victorian era, including industrial buildings and architecture of all varieties: factories, bridges, stations, yards, etc. They all helped to punctuate the monotony of greenery with their purposeful presence. There was certainly a real confidence about Britain’s domestic prosperity in Victorian Britain, and the wonders of industrialisation culminated in the Great Exhibition, which showcased the emergence of your chosen art: photography. Funny to think that modern photographer/chroniclers such as yourself are capturing the remains of a Victorian industrial legacy, such as the Stuart glassworks, using the the very technology-albeit improved and advanced-that was bequeathed by Victorian ingenuity. You are, in some small way, a custodian of a magnificent past, and I sincerely hope that your efforts will eventually be recognised by the wider community. They deserve to be. I had heard about your work from an old photography contact a while ago, but have only just got round to sampling the goods-mightily impressed, sir! You’ve really animated the White House, such that you get a real sense of Britain’s great industrial past. It is truly heart-wrenching to think what we have lost, but thank heavens there’s people like yourself who care enough to display and chronicle the vestiges of our once proud place in the world. More power to you and your magnificent efforts! Although clearly an industrial heritage scene, there is an exotic quality about this photograph that hints at a tempestuous event. Whether it’s the evocative lighting or the menancing shape of the trees, there is a dramatic tension here that quite menaces the imagination. I love the angle of the shot, particularly how the wall has been made to appear so imposing-very clever. Yet again, the photographer is able to showcase his talent for transforming the interesting into something quite extraordinary. Mr Grimes’ commitment to both the chronicling of these precious historical landmarks, along with their rendition into photography art, is exemplary and evidently greatly appreciated by his loyal followers. I am happy to add my voice to the chorus of approval and convey my appreciation for this wonderful service. You are indeed worthy of a lasting legacy.